A self-confessed "technique freak" and "skill junkie", JC Briar dabbles in all kinds of knitting, but has a special fondness for textured knitting and novel construction techniques. If it involves lace, cables, or seamless construction, it's sure to catch her eye. She shares her enthusiasm by teaching at shops and fiber festivals, and online through Needlecraft University. Regardless of the topic, JC Briar aims to build confidence by expressing concepts clearly and concisely, and by presenting skills and ideas in a digestible progression. JC Briar lives in Corvallis, OR. 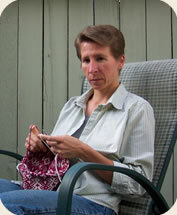 JC Briar learned to knit to fill her free time, while living as an exchange student in Chile. On her return to the US, she had to re-learn knitting terminology in English! This language gap didn't slow her down, though, as she dabbled in all types of knitting, and developed a special fondness for textured knitting and novel construction techniques. If it involves lace, cables, or seamless construction, it's sure to catch her eye. JC's designs have appeared in numerous publications, including Creative Knitting, INKnitters magazine, Janet Szabo's Twists and Turns newsletter, and books published by House of White Birches. Most recently, Blue Moon Fiber Arts has chosen to publish some of her sock designs. Many of her designs begin with "what if?" questions: What if you wanted stripes that zigged one way and stitch patterning that zagged the other way? What if you mixed cables with intarsia, or with lace? What if you wanted to make an entirely reversible sweater? It's this sort of out-of-the-box thinking that JC likes to encourage in her classes. Regardless of the topic, she aims to build confidence by expressing concepts clearly and concisely, and by presenting skills and ideas in a digestible progression. When not teaching at Needlecraft University or fiber festivals, JC brings clarity to knitting patterns as a freelance technical editor. She is also a member of the Association of Knitwear Designers.